Quick. Someone buy this onesie before I do. I just got a gig as a baby fashion blogger. I am so, so totally stealing this post for it! I'd also like that in a hoodie. Hey, I was trolling the streets of MSNBC and saw this article on the numbers of people who simply don't read anymore and wondered about your take on it. One of the interesting statistics said that the majority of people who do read live in the Midwest and West and I'm curious as to how a publishing industry primarily headquartered in the East (New York, in particular) addresses the reading habits/needs of these people and what it could be doing to draw in other demographics. Forgive me for this, but I'm in the first convulsions of my Master's program and I'm starting to think of everything as a possible thesis. More statistics on reading for cap'n ganch. 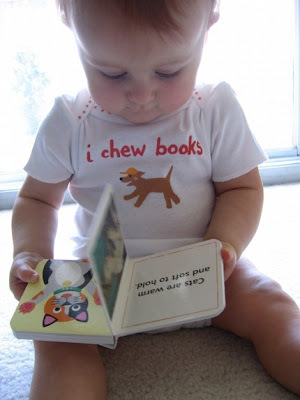 The conclusion: babies eat more books than people read. Awww, that's almost enough incentive for me to go get pregnant right NOW. Just had a baby - he's 5 months. Thanks for the link. I may go get one. and to the commentators...thanks a lot for the reading articles. Wow, that's so adorable! I wish my toddler was little again, do they have it in 2T? Only I guess it would have to say "I tear books"
OMG. So cute! It's a tempting onesie but I've spent my wad for this month.